So now they have to make the best of a bad bargain and pretend that this is exactly what they had been demanding all this time, which of course is not true. What they wanted was a true autocephaly and independence, but instead they were simply re-subordinated under a different command on humiliating terms. I came across this video by a Russian Orthodox priest a few days ago and found it quite interesting - it opened my eyes to certain details about the newly granted Ukrainian Tomos that I didn't hear mentioned anywhere so far. It kind of makes sense now why Constantinople did it and why they wouldn't listen to any pleas from other Churches not to do it. It was a low-hanging fruit, so "pleasing to the eye" and so easy for picking. Indeed, the contents of the Tomos are both eye-opening and far-reaching. It looks like the schismatic Ukrainians have gotten more than they bargained for. 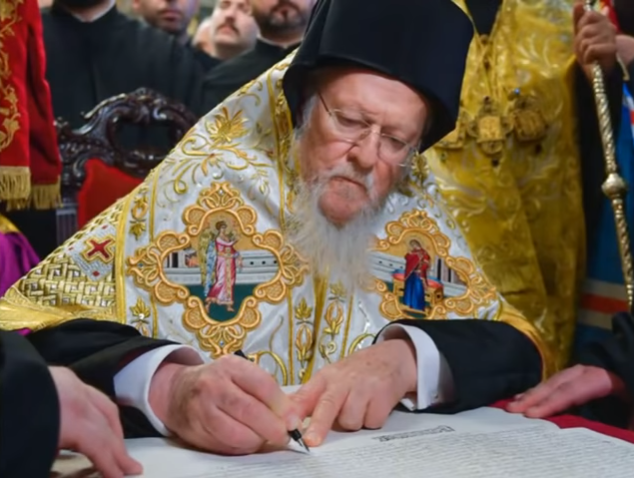 Yesterday Patriarch Bartholomew of Constantinople signed a document called a "Tomos", which has granted the title of an autocephalous church to an organization created from two schismatic structures in the Ukraine. As far as the fact that the Patriarch of Constantinople has entered into communication with the schismatics, I have recorded a separate video on that, where I have mentioned that this is a completely non-canonical act. This is a lawless act, and I personally look at it in the same light as the situation with the schismatics-Renovationists in the 1920's, whom the Constantinople Patriarchate also acknowledged as the 'real' Russian Church and supported for a long time. This however did not make them a real church, and later they were accepted into the Russian Orthodox Church through repentance. And sooner or later the Constantinople Patriarchate had to acknowledge the canonical Patriarchal Russian Orthodox Church. However I do not want to talk about this in detail here. What I would like to do is comment on the text of the Tomos itself. The Greeks have marvelously managed to deceive the Ukrainian schismatics, most efficiently taking advantage of the current political situation to the fullest. Because in reality this is not an autocephaly at all. Even though the word itself is used in the Tomos, the conditions specified in the document for the newly created Ukrainian structure clearly fall within the definition of an autonomous church, not an autocephalous one. I will now show this to you on some concrete examples. Also, while commenting on the Tomos, I would like to draw your attention to some very interesting questions that are raised as a result. As far as I know, these questions have not been discussed by anyone yet. In order to see how exactly Phanar has cheated the Ukrainians, and why I am saying that this is not a true autocephaly, we will compare the conditions of an autocephalous church life of several autocephalous churches - the Russian Orthodox Church, Serbian Orthodox Church, Bulgarian Orthodox Church, and Romanian Orthodox Church -- let us take these four Orthodox Churches on the one hand -- to what is inscribed in the document concerning the newly formed Ukrainian structure on the other hand. 1. The First Hierarchs of the four autocephalous churches - Russian, Serbian, Bulgarian, and Romanian - have the title of Patriarch. The head of the newly created Ukrainian structure will bear the title of a "Blessed Metropolitan of Kiev and all Ukraine; any additions to or subtractions from this title are not allowed without permission from the Church of Constantinople." This is not such a big deal, because there are some autocephalous churches whose heads are Metropolitans or even Bishops, but this is still a curious fact, especially considering that the notorious leader of a schismatic Ukrainian organization Philaret Denisenko called himself a 'Patriarch'. 2. The former so called Kievan Patriarchate, copying the structure of the Moscow Patriarchate, had a Synod with permanent members. The Tomos cancels that practice and introduces a new one. From now on "the Synod will be called annually by invitation from the number of bishops who have dioceses within the borders of the Ukraine, invited in turn, according to their ranks." So the newly formed Ukrainian structure does not have the right to have a Synod consisting of permanent members. But even this, although it's a substantial point, is not enough to say that this is not the true autocephaly. However, the points to follow are very interesting indeed. 3. The true autocephalous churches that we've taken as an example all have overseas dioceses and overseas parishes. But the new Ukrainian church, as spelled out in the Tomos, "does not have the right to appoint bishops or establish parishes outside the country's borders; the ones that already exist from now on shall be governed, according to the due order, by the Ecumenical See, which has canonical authority in the diaspora, because the jurisdiction of this church is restricted by the territory of the Ukrainian state." This is a very interesting point that we'll examine closer a little further down. By means of this point, the Constantinople Patriarchate grabbed hold of the many overseas parishes that belonged to the Ukrainian schismatics. And it's not only a matter of a single incident of appropriation of such parishes, but also the forbiddance to establish any parishes and dioceses overseas in the future, whereas the autocephalous Russian, Serbian, Bulgarian, and Romanian Churches that we used as an example quite happily have their own overseas dioceses and parishes. 4. The next important point is that all true autocephalous churches possess the fullness of judicial power within their boundaries. Not one of them in their Church Constitutions assumes the right to final judicial appeal to Constantinople, because all these Autocephalous Churches see themselves as having full judicial power. However the newly created structure in the Ukraine does not possess full judicial power, as it is stated in the Tomos that "all bishops and other clergy retain the right to appeal to the Ecumenical Patriarch, who has the canonical power to make final and irrevocable judicial decisions concerning bishops and other clergy of local churches." This is a well-known claim by the Constantinople Patriarchate which is not supported by any other Churches, and we are not going to talk about it in detail here. But the fact is that it is now institutionally stated in the Tomos that the newly formed Ukrainian church does not have the full judicial power on its own territory over its own clergy. The final power over its clergy is reserved by the Patriarch of Constantinople. 5. The Tomos also contains an interesting statement that "the authocephalous church of the Ukraine considers as its head the Holy Apostolic Ecumenical Patriarchate." The word 'autocephaly' consists of two Greek roots - 'autos' - 'self', and 'cephalia' - 'head'. So the term itself means that such church is governed by its own hierarch as its head, and in terms of hierarchy does not have any other heads. Of course, in the mystical sense, the Head of all Local Churches, is Jesus Christ, but in terms of hierarchal structure, the head of any autocephalous church is its own hierarch. That's the whole meaning of an autocephaly. However the Tomos states that the newly formed Ukrainian structure is headed not by its own Metropolitan of Kiev, but by the Ecumenical Patriarch. And, as you can guess, none of the real autocephalous Churches that we've used as a comparison has this or similar statements in their Church Constitutions. 6. This is a minor point, but still quite remarkable. After his appointment, the head of the Ukrainian church is required to send his so called peace missives to the Ecumenical Patriarch first, and then other hierarchs, as well as start his peaceful visitations to the First-Throned Church of Constantinople first, and then to other churches. This is not that important, but, of course, the truly autocephalous churches are free to decide for themselves which local churches their first hierarchs may want to visit, if at all. But the head of the newly formed Ukrainian structure does not have even this kind of freedom, even this is regulated and spelled out for him. 7. Now here is a very important point. All autocephalous churches, such as the Russian, Bulgarian, Serbian, and Romanian Churches, make their own Holy Chrism (Myrrh). But the new so called Ukrainian Orthodox church does not have this right, and according to the Tomos it is required to obtain the Holy Chrism from Constantinople. To people far from the church life this doesn't say anything at all and doesn't hold any importance. But those familiar with the church life understand how important this point is. As you know, the entry into the Orthodox Church is granted through Baptism, which in its modern form includes two Mysteries - the Baptism itself and the Chrismation. The Holy Chrism is necessary for the Chrismation. Without Chrism it would be impossible to perform any baptisms, at least according to the procedures outlined in the Church rubrics. Of course, there may be exceptional circumstances when a person may be baptized without receiving Chrismation, but after that, in order to be fully received into the Orthodox Church, they do have to be chrismated. Thus, Chrism (Myrrh) is something that is absolutely necessary for the normal functioning of a Church's life. So by reserving the right to hand out the Chrism Constantinople in fact retains an important lever of influence over the new Ukrainian structure. Should this structure do something that Constantinople doesn't like, it may well threaten to withhold the distribution of Chrism. And if you don't have Chrism, you cannot perform baptisms, because sooner or later you'll run out of Chrism and will have to ask for more. 8. It is stated in the Tomos that on the territory of the Ukraine there has to be established an exarchate of the Ecumenical Patriarchate, with at least 20 churches and monasteries which will be governed by it directly and, as spelled out in the Tomos, "the rights of the Ecumenical See to the exarchate in the Ukraine remain undiminished." Not a single one of the above mentioned true autocephalous Churches has any exarchate of the Constantinople Patriarchate on their territory. 9. Finally, the Tomos prescribes that "for the handling of important matters of the ecclesiastical, dogmatic, and canonical nature, Metropolitan of Kiev and all Ukraine, on behalf of the Synod of his Church, is required to appeal to the Holy Ecumenical Patriarchal See in order to obtain its authoritative opinion and mutual understanding." Whereas the true autocephalous churches are not required to appeal to Constantinople for its authoritative opinion in order to handle such matters. They handle these matters independently themselves. Throughout all the points outlined above, we can see that according to the Tomos the newly created Ukrainian structure is losing its rights on all points compared to the real autocephalous Churches. What is regulated by the Tomos is in fact the status of an autonomous church, which is just being called 'autocephalous'. Because everything that the Tomos has granted the Ukrainian schismatics, all of that already belongs to the autonomous Ukrainian Church that is in union with the Russian Church - the right to elect its First Hierarch, the right to handle its own matters independently without appealing to Moscow... On some points it may even have more freedom, for example, it has its own permanent Synod. So in reality, Constantinople, under the disguise of autocephaly, has skillfully and gracefully imposed onto the newly formed Ukrainian schismatic structure the status of an autonomous church under the jurisdiction of the Ecumenical Patriarchate. The leaders of the Ukrainian schismatics do understand that they were cheated, because all those points mentioned above that are characteristic of the true autocephalous churches, - all those points were previously craved by the so called Kievan Patriarchate. So now they have to make the best of a bad bargain and pretend that this is exactly what they had been demanding all this time, which of course is not true. What they wanted was a true autocephaly and independence, but instead they were simply re-subordinated under a different command on humiliating terms. It would be naive to think that the Ukrainians might find a way to somehow circumnavigate those strict rules or ingore those conditions. This won't work. It is spelled out in the Tomos that the 'autocephaly' is granted specifically "on all of these conditions", so should the Ukrainian quasi-hierarchs try to break or ignore any rules, Constantinople can easily cancel this Tomos, just as it recently cancelled one given to the Russian Exarchate, or even a more ancient document (of 1686). Now let us look more closely at the overseas parishes of the Kievan Patriarchate. It has around 70 parishes in the United States, Canada, various European countries, Australia. While the parishes in Europe may have no temple buildings of their own, parishes in the USA are ones that possess some substantial church real estate and temple buildings, all of which will now be passed over to the Constantinople Patriarchate. On top of all of this, the Kievan Patriarchate has a diocese in the Republic of Moldoova, and two dioceses on the territory of Russia. Yes, the Ukrainian Orthodox Church of the Kievan Patriarchate is officially registered in the Russian Federation, it has three bishops and two or three temple buildings. So here's an interesting situation. According to the Tomos, the canonical territory of the newly established structure is restricted by the borders of the Ukrainian State. Therefore, all overseas parishes, the ones that are located outside of the Ukraine, have to be re-subordinated to the Constantinople Patriarchate. This means that, according to the Tomos, the Constantinople Patriarchate has received the dioceses on the territory of Russia, and those are now the dioceses of the Constantinople Patriarchate, and hierarchs of the Constantinople Patriarchate will be established in Russia. Thus, the Patriarch of Constantinople, via his Tomos, is intruding not only on the territory of the Ukraine, but also on the territories of Moldova and the Russian Federation. Moldova has four parishes that are also now to be subjected to the Constantinopel Patriarchate. But this is not all. The Kievan Patriarchate also has a parish in Slovenia. Slovenia is a canonical territory of the Serbian Orthodox Church. So by means of this Tomos the Constantinople Patriarchate is also intruding into the Serbian territory. This fact deserves more attention, as for some reason it is not being discussed in relation to the Tomos, as if the matter concerns only the territory of the Ukraine. This is not so. As we can see, the problem does not concern only the territory of the Ukraine. It would be also curious to see the reaction of the former overseas parishes of the Ukrainian Patriarchate. For example, there is a Metropolitan of Paris and all France, Philippe Laroche, who wrote this book in French called "Historical Origin of Papism of the Constantinople Patriarchate and its Ecclesiastical War against the Moscow Patriarchate". It is somewhat ironic that the author of this book will now himself become the clergyman of the Constantinople Patriarchate and the victim of the said papism and the war against the Moscow Patriarchate. In conclusion, this is in no way an 'autocephaly'. It is a pseudo-autocephaly, quasi-autocephaly, call it whatever you will. The deception was executed expertly - under the guise of granting autocephaly to grant the word 'autocephaly', but in reality, not to give any autocephaly at all, but to impose subjugation instead, impose the same status of autonomy that the schismatics have been running away from for years. And the leaders of the former Kievan Patriarchate are well aware of this. They were placing a lot of hope in their overseas parishes. Back in October the so called archbishop Hilarion (Protsyk) said in an interview that the overseas dioceses of the Ukrainian Patriarchate are "islands of faith and hope" and he hopes the Constantinople Mother-Church will support them... Not happening. You may as well bid farewell to those islands. The islands have drifted away. They saw what was happening, they knew what they were being deprived of, they tried to wrestle with Constantinople, and they lost. And as a result they had to accept rather humiliating conditions and, in fact, give consent to this deceit of their own people, carried out in collaboration by Mr. Poroshenko and Patriarch Bartholomew. I find it quite ironic.